For the Introduction / Rules / Schedule / Prizes / Position / Tutorial / etc. Please click here. For the News and the Rankings, Please click here. So, here we are again, after another great tournament, maybe one of the most exhausting one... not only for the participants, but also for me! The idea worked quite well, with a few problems of its own of course, but the result is as always of the highest quality. In many cases it was not possible to validate the problems with the computer, thus one needs to put extra effort to verify them as best as possible from a human perspective at least. Many of the problems remain C?, thus, although hopefully none is, there may unfortunately be some which turn out to be incorrect. As said previously, the quality was really high, with some fantastic problems and ideas discovered as you will soon find out. The C category, for Parry problems, that was added after the start also proved most interesting; although most complex no doubt. Few problems were composed in total in both sub-categories, but they are all special, with an out-of-this-world idea that seems unbelievable to turn out C+. Congratulations to Arno for winning the A1, B1 and C1 categories, and also the number of records category! Arno must be said found a truly unbelievable idea, a super cage, that works just perfectly! Amazing stuff... and all his entries are C+! I will not comment on any of the problems to let you appreciate them first independently; feel free to send me yours and I will add them accordingly. A nice version that places emphasis on the logical idea behind the problem rather than the record. 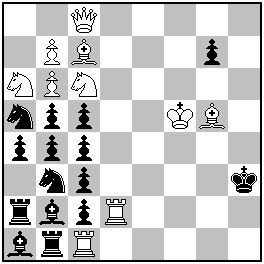 Therefore Black must promote a black knight on b1 that can capture the wQ coming from a7. However, after 10.b2-b1S? Black has not enough maneuvering force to achieve that goal. Therefore, first a black queen must be promoted and only the bPb5 can become a knight!" A brilliant problem composed by Arno before the super cage idea came. An interesting idea, showing the Zellers trap with the Black Queen!